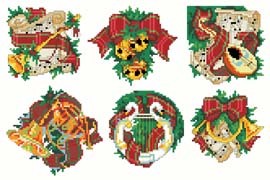 Six lovely images of musical instruments and sheet music decorate these Christmas ornaments. Holiday greenery highlights the motifs. They can be finished as round or square ornaments. The ornaments are sure to please the music lover in your life.